The Canon PowerShot SX160 is a portable high-zoom digital compact camera. It features a 16 megapixel sensor, 16x optical zoom which is image stabilised, manual modes for controlling shutter-speed and aperture, digital effects and it takes AA batteries. 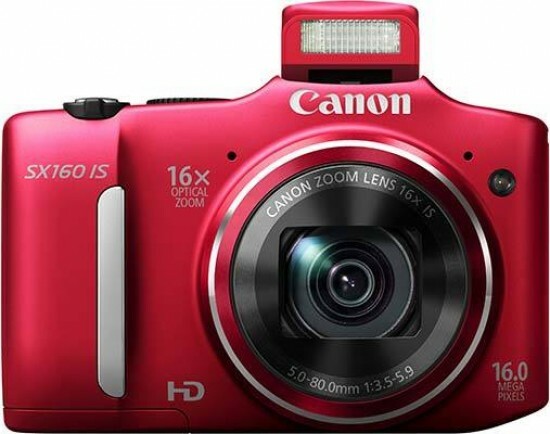 Priced at around £140 / $229.99, the Canon PowerShot SX160 IS is available in Red, Black and White. It's easy to dismiss the Canon PowerShot SX160 IS without closer inspection but doing so is definitely worth it. The large lens on the front and raised central area of the top plate give it a bridge camera look. The lens is a 16x optical zoom with image stabiliser built in. The price will dictate a standard lens with no special elements for low dispersion or chromatic aberration correction. Hardly a pocketable camera, the lens sticks out by a good centimetre from the main body. It makes the Canon PowerShot SX160 difficult to carry around discreetly. The most comfortable way is by hanging it round your neck with an additional neck strap that isn't included in the box. On the top plate, the Canon PowerShot SX160 houses a pop-up flash in the raised area towards the middle. It's activated by pressing the black button just above the screen. A large command dial sits just to the right of the flash and it might not be the first time that a command dial has been included on a camera of this price but we still think it's pretty swell of Canon to include it. There are 10 options ranging from full manual mode to fully automated where the camera stops shy of taking the picture for you. As well as Manual (M) mode, there's also Aperture-priority (Av – Aperture Value), Shutter-priority (Tv – Time Value) and Program (P) modes. These allow you to take more control over your photography. It's a “Kodak” philosophy about bringing photography within reach of everyone which is great. It means you don't have to spend a fortune on a camera to learn more about photography. The aperture range is limited from f/3.5 – f/8 while the shutter speed range is 15sec to 1/3200sec. There are a few cool features on the Command dial that will do everything for you too. The Live button is an easier way of controlling the exposure features of the Canon PowerShot SX160. Pressing the Set button brings up three sliders that have different values: Light/Dark, Vivid/Neutral and Warm/Cool. By adjusting the sliders, you can alter the look of the picture. This is great for if you know what you want to do but you're not quite sure how to achieve it yet. The icon that looks like the Death Star orbiting Yavin to find the Rebel base gives access to the digital filters. These filters include Miniature, Toy camera, Monochrome, Super vivid, Poster effect and Fish-eye. There's nothing new in these effects, which is a shame but Canon aren't going to use a low spec camera to test new tech. The large 3 inch screen dominates the rear of the Canon PowerShot SX160 with a quarter of the back left for buttons and dials. Still, Canon have managed to make the buttons bigger and easier to find. The navigation pad acts as a wheel for speedier navigation through the menus. There's a direct video button and surprisingly, a direct ISO button. The outside of the Canon PowerShot SX160 feels a bit plasticky and despite its size, it's very light suggesting plastic insides too. For those of you with larger hands, the camera is an ideal size to hold and shoot with. Because of the larger area of space available, there's more room to put bigger buttons on without making it all look cramped. In fact, there's still space for a decent sized thumb rest. The cover for the HDMI and USB ports is made of plastic instead of rubber – which is great. It only clips in though with no locking system. The battery door does have a lock on it which is good for two reasons: First, the Canon PowerShot SX160 takes AA batteries and they operate by being forced in against springs to keep them in place; Secondly, because of this pressure the door can and will pop open at the slightest knock. A lock on it prevents this from happening so is a wise decision. There are two main menus to use when taking pictures. Arguably, the one you'll use most is the Function menu. It's accessed by pressing the button in the middle of the wheel on the back of the camera. Interestingly, it changes depending on the mode it's in. In manual modes such as P, Av, Tv or M the menu is wider with features such as white-balance, colours, flash compensation, metering and compression. Auto is more simple with only three options for aspect ratio, file size and video quality. Live mode also only has three modes which we mentioned earlier. The main menu is more extensive and holds modes that, once changed, will generally stay that way for a while. There are two tabs for shooting options and general set-up options. There are various autofocus modes, flash settings, playback options as well as in-camera help for shooting successfully. For example, the camera can have grid lines switched on which show a noughts and crosses (Tic Tac Toe) board on the screen. Placing horizons, gate posts, sign posts etc on the lines or subjects of interest on the intersections creates more appealing photographs as this obeys a photographic law called the Rule of Thirds. Along with the grid lines, there's also a feature called i-Contrast. This feature increases the dynamic range of the picture to create a more balanced exposure. This is generally named HDR (High Dynamic Range) but it's not as strong as that. Start up time of the Canon PowerShot SX160 is a fraction slower than we've seen in cameras around the same price range. It's such a tiny amount that it wouldn't even be noticed in the real world. We usually get an average tine of around 2.5 seconds from switching the camera on, to focusing and taking a picture. The opening sequence of having to look at the Canon logo is what takes time. The opening logo can be removed and it does shave the time down by a little but not enough to be on par with other cameras. The Canon PowerShot SX160 has two burst drive modes; one continuous shooting mode and one that also tracks a moving subject and stays focused on it. Both run at the same rate but we used the former so that it didn't slow down to realign focusing. We only managed to get five images in a 10 second period which is slow. It works out at around half an image a second, or one every two seconds. Buffering is fast after that. The pictures were all stored on the card after 13 seconds had elapsed. There are several playback options; that is, how you want to view them. Pressing the Disp. Button will cycle through them. There are two for normal photographers who simply want to point and shoot. One shows no information while the other shows some basic shooting info such as the date, resolution and file number. For more advanced users, you can bring up more detailed information such as the ISO, aperture, shutter speed, file size and even a histogram. Pressing the button again is for pixel peepers that want to make sure the picture is sharp. The Playback menu has been changed into a sharing platform on digital compact cameras these days and the SX160 is no exception. There's a slide-show option, Favourites and Photobook set-up. If you want to edit after, you can add i-Contrast or My Colours. More traditional options include Red-eye correction, cropping and resizing. There are also various print options in a separate tab as well as the set-up menu seen in the shooting main menu. Because of the AA battery usage, there's little in the box of the Canon PowerShot SX160. Aside from the camera, there's two AA batteries to get you started, a wrist strap and the software CD with associated booklets such as the Quick Start Guide. On the CD is a full camera operating manual as well as Solutions v.119.0, Canon's basic editing and tagging program.